Making ice cream is fun for most people, but if you’re vegan and you have a fondness for frozen desserts, it’s kind of essential. Sure, you can buy vegan ice cream at just about any grocery store now, but if you want more exotic flavors, you’re going to have to make them yourself. Luckily, it doesn’t have to be hard and you don’t even need an ice cream maker to do it. Hooray! 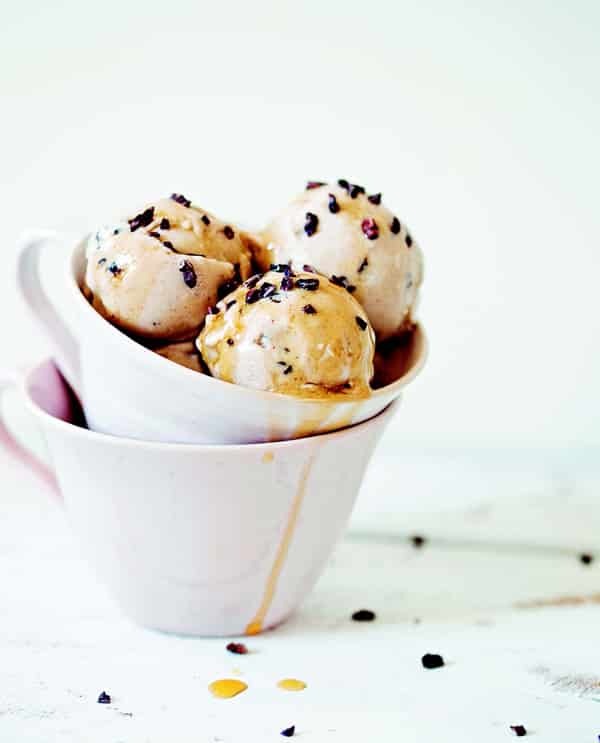 N’ice Cream: 80+ Recipes for Healthy Homemade Vegan Ice Creams by Virpi Mikkonen and Tuulia Talvio is the perfect resource for vegan ice cream enthusiasts. If you’re looking for a book that goes beyond basic flavors, this is it—you’ll find recipes for Salty Caramel Popcorn Ice Cream, Creamy Tahini Ice Pops, Strawberry Basil Creamsicles, Sesame Black Licorice Ice Cream, and more. Of all the recipes in the book, this Roasted Banana Ice Cream is one of our favorites. Bananas are roasted to caramelized perfection and blended with creamy coconut milk, almond milk, and vanilla, then cacao nibs are folded in for a little richness (and crunch!). Enter to win a copy of N’ice Cream on the Marketplace or purchase it on amazon.com. Preheat the oven to 350°F (175°C). Line a baking sheet with parchment paper and set aside. Slice the bananas into 1-inch (2 to 3-cm) pieces and spread them on the prepared baking sheet. Sprinkle the bananas with the cinnamon. Bake for 30 minutes, turning once halfway through, until the bananas are brown and soft. Remove from the oven and let cool completely, 30 to 45 minutes. Combine the bananas, coconut milk, almond milk, and vanilla in a blender and blend until smooth. Taste and add more cinnamon or a splash of sweetener, if desired. Add the cacao nibs and stir with a spoon. Pour the mixture into an ice cream maker and prepare according to the manufacturer’s instructions. Serve immediately or transfer to a freezer-safe container, cover, and freeze until ready to serve. Let the ice cream thaw for 10 to 15 minutes. Scoop ice cream into bowls, drizzle with maple syrup, and serve. Pour the ice cream mixture into a freezer-safe bowl and freeze for about 3 hours, mixing well every 30 minutes. Scoop into bowls, drizzle with maple syrup, and enjoy! Just making this for the fourth time, though I never wait for the bananas to cool, fter I missed this step the first time. I found it works with less ripe banana as wella. T hanks for posting the recipe.. I love the styling of the Ice cream photo so inspirational.